Beer duty should be cut by a penny in this month's Budget to help save pubs from closing, the British Beer and Pub Association (BPA) has said. 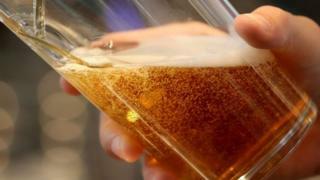 It comes as sales of beer in the UK's pubs, bars and restaurants have fallen by the biggest margin for five years. The BPA said 35 million fewer pints of beer were sold in British pubs, bars and restaurants in the three months to September, compared with a year ago. In March, beer duty increased by 2p a pint, the first rise in five years. Chancellor Philip Hammond will deliver his next Budget on Wednesday 22 November. The BPA warned that pubs will continue to close if the trend continues, blaming "sky high" business rates - particularly in London and the South East, where prices are higher still. Chief executive Brigid Simmonds said: "When the government was cutting or freezing beer duty from 2013-15, sales of British beer stabilised, after years of steep decline. "Beer has had a 39% tax rise in the past decade. With tax rates 14 times higher than in Germany, these levels are unsustainable." While the number of breweries in Britain is up almost two-thirds in the past five years, the number of pubs continues to fall and is down 17% since 1996. Many are preferring to drink at home, with sales in supermarkets having overtaken those in pubs. The average price of a pint in the UK is now £3.60 - up by 13p on 2016 - according to the Good Pub Guide. "We need fair taxes for British beer, so that brewers and pub operators can invest in thriving pubs, and take advantage of new opportunities to export more beer around the world as we leave the EU," Mr Simmonds added.